“One of the nation’s best-performing nuclear facilities” therefore sprang a leak in its condenser tubes while not even working at full power after two weeks worth of repairs. 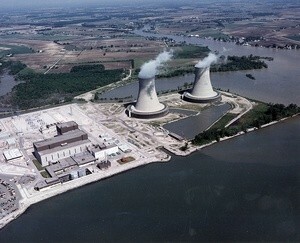 It’s scary to think what happens at other US nuclear power plants. As often happens, reality contradicts the words of the owners of the Fermi 2 reactor and the propaganda about the reliability of nuclear power. But if in the United States the owners of a plant have to bear the cost of an outage of this nature, then in Russia the expense is passed on to the state budget via Rosatom, Russia’s state nuclear corporation. In September of 2008, DTE Energy announced intentions to build another reactor on the site of the Enrico Fermi Nuclear Generating Station. The idea provoked protests by various civil initiative groups who underscored that a new reactor would pose health and environmental dangers. Lake Erie, one of five North American lakes that form the largest group of freshwater lakes on Earth by total surface and volume.